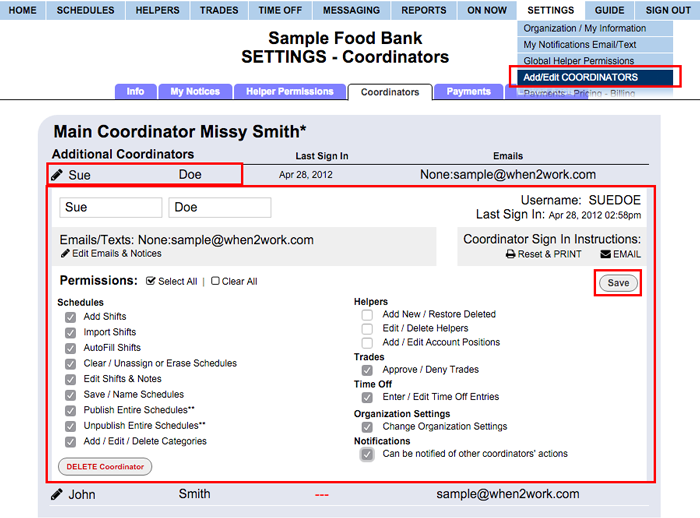 ONLY THE MAIN COORDINATOR ON EACH ACCOUNT CAN ADD & SET PERMISSIONS FOR COORDINATORS - and MAIN COORDINATORS CAN EDIT SIGN IN INFORMATION FOR ALL OTHER COORDINATORS. Each WhenToHelp account has one Main Coordinator (the coordinator who created the account) and can add any number of additional coordinators who can be limited in what they can see and do when they sign in. The main coordinator will see the Add/Edit Coordinators under Settings in the top menu. Each Coordinator has a unique Coordinator username and password (IN ADDITION TO any username & password they may have to sign in as a Helper) and can perform only the functions that you allow.